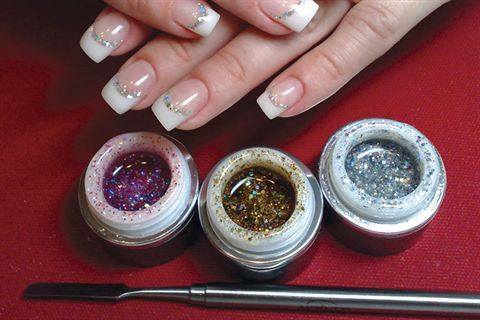 Akzéntz Classic Gels are high-performance gels that can be combined with the Options Soak-Off Color Gels and Options Aurora Sparkle Gels to produce vibrant nail art designs and structurally sound enhancements. 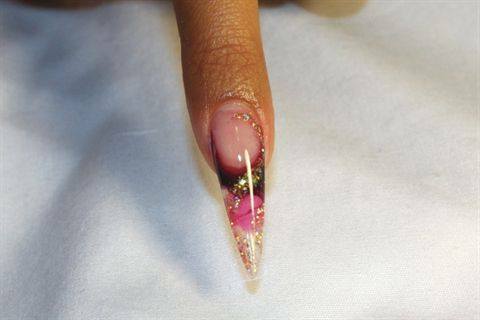 Akzéntz Classic Gels are high-performance gels that can be combined with the Options Soak-Off Color Gels and Options Aurora Sparkle Gels to produce vibrant nail art designs and structurally sound enhancements. Akzentz offers all the products a tech would need to begin working with gels immediately and efficiently. 1. 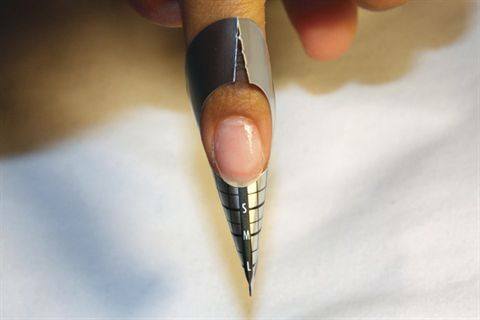 Prep the nail, shape the edge, apply a form, non-acid primer, and bonding gel. Cure for two minutes. 2. 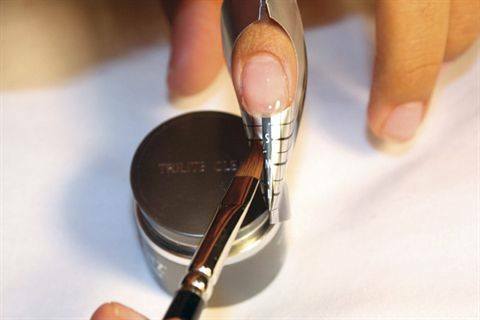 Apply a moderately thin coat of Trilite from the apex to the end of the form. Cure for two minutes. 3. 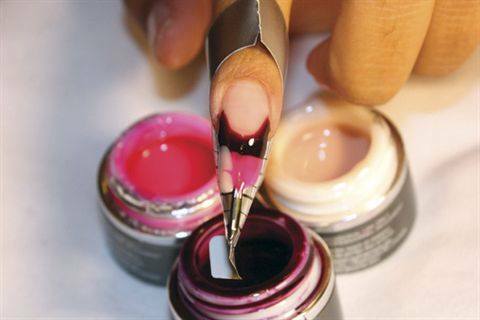 Apply desired colored gel at the smile line (Merlot is used in picture). Do not cure yet. 4. Dab on two other gel colors of your choice (Bare and Hot Pink are used here). Again, do not cure yet. 5. 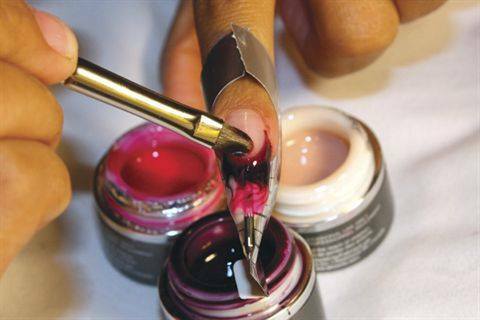 Using a small pointed brush, drag the Merlot into the other gel colors with a light touch. It does not have to be exact. Do not cure yet. 6. Wipe the smile line. Cure for two minutes. 7. 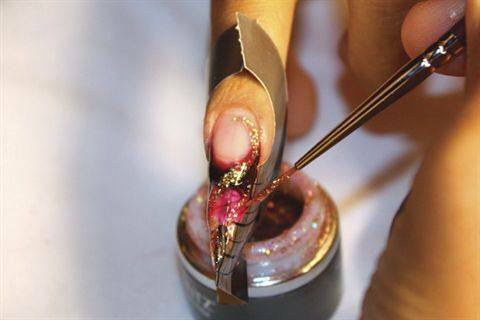 Using a striping brush, pick up some glitter gel (Aurora Apricot is shown). 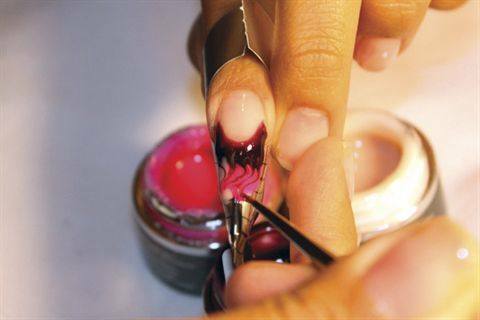 Apply swirls and lines in desired areas. Cure for two minutes. 8. Cap in clear gel (Modeling is used here), making sure you achieve good structure. Cure for two minutes. 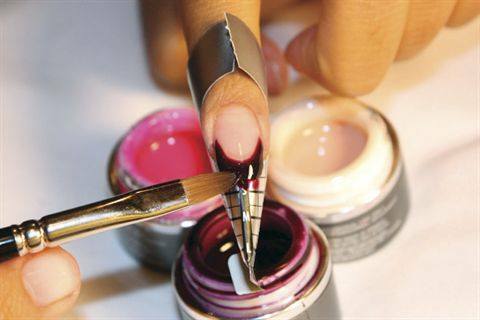 Remove the tacky layer, finish file, and apply top gel (Top Gloss is used here). Cure for two minutes. Remove the tacky layer.